The Uncurated Life: Paez Wants to take You Skydiving! Paez Wants to take You Skydiving! If given a chance to skydive, would you take it? I would! So read up on this exciting news from Paez Philippines. They're cooking up something for you and it's once in a lifetime chance! Walk in comfort and style and be one of Paez's #DreamJumper. They are giving one lucky follower a chance to tick off skydiving from their bucket list! 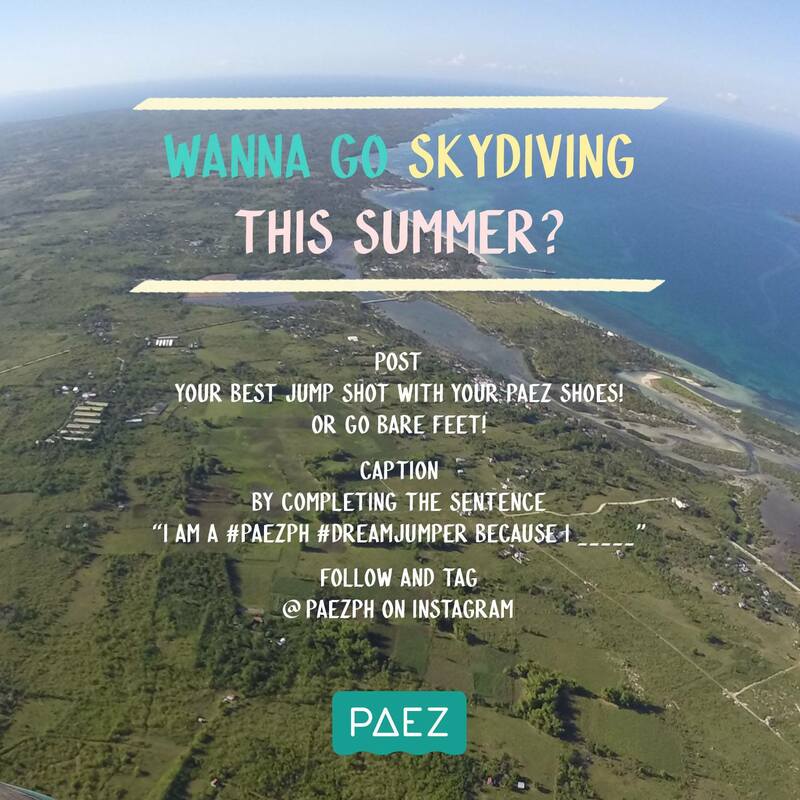 All you have to do is post your most awesome jumpshot on Instagram tagging @PaezPH, with hashtags #PaezPH and #DreamJumper. So darn easy, right? Winning entry will get to go with his or her friends in a skydiving adventure in Bantayan Island! What a great prize! The winner will be selected based on the most number of Instagram likes (legit likes of course! ), brand ambassador Nico Balzicco's choice, Peaz Founder's Tomas Pando's choice and the rest of the Paez team! Yup, that's a tough panel of judges so you gotta bring your #jumpshot A-game on! If you're like me who can't do a jumpshot to save her life, don't worry! Paez has something for us! They are bringing back their "Buy Two, Get One Free" promo! And if you've been a Paez loyal customer, enjoy P300 worth of gift voucher with a P3000 single purchase of any footwear merchandise of Paez! And right on time because their Summer 2016 collection is in stores! This offer is only until April 30 so better take advantage of it! As in now na! Summer 2016 collection looks so fresh! With sling-forms and flatforms, you don't have to sacrifice style for comfort. With Paez, you get both! I'm just really glad that these shows are trendy now. Alpargatas shoes gives way to inserting fun through unique and vibrant prints. Definitely invoking a Summer vibe and rightly so in our laid back tropical island. Crowd's favorit is this one above with the cutest birds ever! The Minis are too cute for words! Gotta get Claud a pair or two just so she can experience the comfort wearability of Paez shoes. My heart went out for the Mood's! It's sooo pretty! Paez is definitely one that can take you anywhere. Travel, lifestyle and design in one pair of shoes. Paez is located in Powerplant Mall, Glorietta 4, UP Town Center and Trinoma!